The British engineer Arthur James Postans (1867-1940) from South Kensington, London, applied for patent for an adding machine in 1902 in several countries. The British patent №GB190224868 (see the lower patent drawing) and the German patent were granted in 1904. The next year Postans obtained a US patent also (patent №786839). Later Postans received patents for the same device, or improved devices, in Canada, Switzerland, Sweden and 3 more British patens. 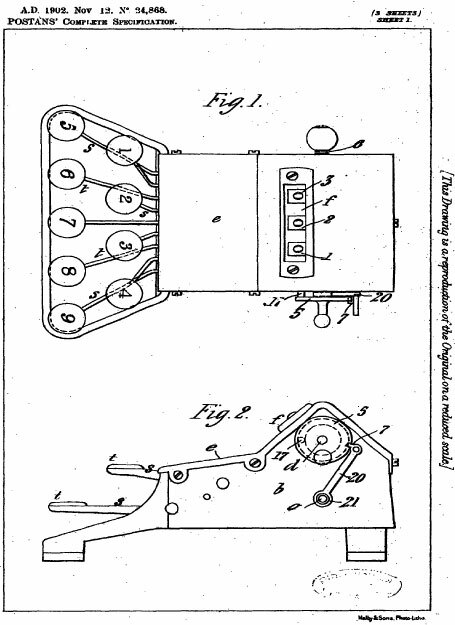 The patent describes an adding-machine in which the depression of keys having on them the index-numbers moves a series of drums in such a way that the number formed by the position of numerals on their peripheries and appearing through an opening in the casing is increased to the extent of the number appearing on the key that has been depressed. The machine (see the lower photo) was manufactured by the Adder Cash Register Syndicate Limited of London, England, since 1908 till 1920s and was sold under the name Adder. The dimensions of Adder are 120 x 180 x 115 mm, weight is 1.71 kg. 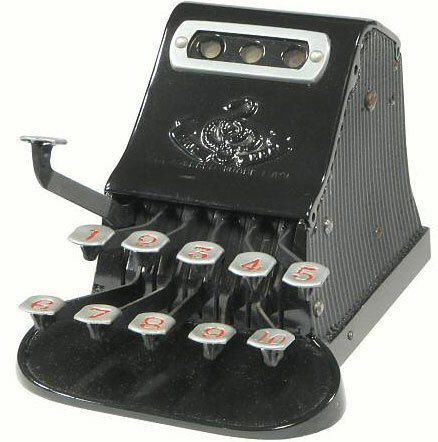 The Adder was a single-column single-axis adding machine with three results dials and a ten-key setting mechanism. The three dials are mounted side by side behind the window at the top of the machine. The setting keys are numbered from 1 to 10 and operate on the right-hand (units) dial only. An automatic tens-carry mechanism advances the tens and hundreds dials as required. The clearing lever at the left-hand side returns the three dials to zero. Who was the inventor—Arthur James Postans? Arthur James Postans was born in 1867 in Samford, Suffolk. He was the son of a malster and farmer—Henry Draper Postans (1837-1922), from Stoke by Nayland, Suffolk, and Julia Norman (1841-1921), from Colchester, Essex. Henry and Julia married in 1863 in Colchester, and had three children: besides Arthur, they had another son—John Musgrove (1869-1958), and a daughter—Julia May (1865-1953). In 1890 Arthur James Postans married in Bloomsbury London to Harriet Mary Cocke (Cooke) (1859-1943). They had two sons: Arthur Norman Fleetwood (1891-1952) and Roy William Clivion Lovegrove (1892-1970), and two daughters: Margery Elizabeth Ellison (1895-1979) and Mary Romara (1895-1963). Arthur became an experimental engineer and starting from middle 1890s he was granted numerous patents not only for adding machines, but also for other devices like: driving-gear for velocipedes, electrical ignition apparatus for internal-combustion engines, safety razor, zeroing mechanism, stropping-machine for razors, indicator for cash-registers, printing mechanism for cash-registers or like machines. Arthur's brother, John Musgrove, was educated at an Ipswich boarding school before following his father and grandfather's footsteps as a farmer. He won a gold medal in shooting at 1908 Olympic Games in London. Arthur James Postans died in 1940 in Alcester, Warwickshire.